Bl. Cyprian Michael Iwene Tansi was born in 1903 in Igboezunu, at the edge of: the forest near the ancient city of Aguleri in southern Nigeria. His parents, Tabansi and Ejikwevi, were Igbo farmers who practised the "traditional religion" and gave him the name Iwene at birth. In 1909 he was sent to the Christian village of Nduka, where he was baptized three years later by Irish missionaries and given the name Michael. His peers described him as studious and very demanding with himself, with a precocious personality and deep piety. At the age of 16 he received his first school leaving certificate, which qualified him for teaching. He taught at Holy Trinity Primary School in Onitsha for three years and served for a year as headmaster at St Joseph School in Aguleri. In 1925, against the wishes of his family, he entered St Paul's Seminary in Igbariam. After finishing his philosophical and theological studies, he was ordained a priest in the cathedral of Onitsha on 19 December 1937 by the missionary Bishop Charles Heerey. 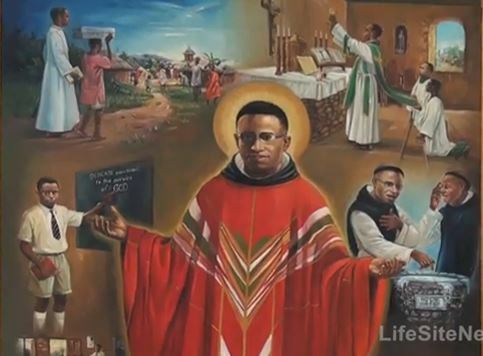 The second indigenous priest of Onitsha and the first in the Aguleri region, he began his pastoral ministry in the parish of Nnewi. In 1939 he was appointed parish priest of Dunukofia (Umudioka region), where he courageously tackled immoral customs and destroyed the harmful myth of the "cursed forest", which weighed heavily on the peace of consciences and families. To combat premarital cohabitation, he set up marriage preparation centres where girls and young women could be sheltered and receive Christian formation. For the moral education of young people he also established the League of Mary, with remarkable success. On foot or bicycle, Fr Tansi went from village to village preaching, catechizing and setting up prayer centres that eventually became parishes. He spent hours and hours hearing confessions, even until late at night. His zeal, shining example and life of prayer and penance transformed the people into a true Christian community resulting in so many vocations to the priesthood and religious life that his parish held the diocesan record. The same energy characterized his years as parish priest of Akpu, where he served from 1945 until his transfer to Aguleri in 1949. On an unspecified date between 1949 and 1950, during a priests' day of recollection, Bishop Heerey expressed the desire that one of his priests would embrace the monastic life so that he could later establish a contemplative monastery in his Diocese. Fr Tansi immediately said he was willing. Bishop Heerey contacted the Trappist Abbey of Mount St Bernard in Leicestershire, England, which was willing to receive him for a trial period as an oblate. In the summer of 1950 he led his parishioners on a pilgrimage to Rome for the Holy Year and left from there for Mount St Bernard. After two and a half years as an oblate, he was admitted to the novitiate on the vigil of the Immaculate Conception, taking the name Cyprian. One year later he took his simple vows and was solemnly professed on 8 December 1956. For the next seven years he lived a hidden life of prayer and work, humility and obedience, in faithful and generous observance of the Cistercian rule. In 1963, after 13 years of valuable experience as a Trappist, the time now seemed ripe for establishing a monastery in Nigeria. However, political tensions led his superiors to choose neighbouring Cameroon for the foundation instead. This was a hard blow for Fr Cyprian, who had been appointed novice master for the African monastery. It was the only time in 13 years of monastic life that he ever lost his temper, but he quickly regained control and accepted God's will with supernatural heroism. In January 1964 he began experiencing intense pain in one of his legs. Diagnosed as having thrombosis, the following morning he was found unconscious and was taken to the Royal Infirmary of Leicester, where examination revealed an aortic aneurysm. He died the following morning, 20 January 1964. He was buried at Mount St Bernard on 22 January. Present for the funeral liturgy were several Nigerian priests living in London, including his spiritual son, Fr Francis Arinze, the future Archbishop of Onitsha, Cardinal and President of the Pontifical Council for Inter-religious Dialogue. His body was exhumed in 1988 and reburied in the priests' cemetery near the cathedral of Onitsha, where he had been ordained a priest 51 years earlier. After the beatification ceremonies, his remains will be buried in the parish church of his native village, Aguieri.